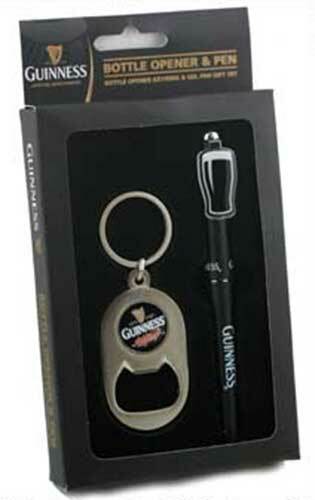 Guinness gift set includes a gel writing pen along with a combination bottle opener key ring. This Guinness set features a writing pen along with a key ring that are handsomely packaged in a branded gift box. The Guinness key ring is stainless steel and it features a built in bottle opener while the pen is enhanced with a classic pint design. This Irish accessory is just one of the many Guinness gifts that are available at The Irish Gift House. Guinness key ring features a pint shape design and it also serves as a can tab opener. Guinness key ring features a pint shape design and it also may serve as a can tab opener. Guinness luggage tag is a black and cream pint shape design. Guinness lanyard features green cloth with alternating white shamrocks and the word Guinness.